Recently, I wrote a post about Mao and Complex Post Traumatic Stress Disorder (CPTSD), and provided “overwhelming” evidence that Mao may have suffered from CPTSD. The reason I first thought of this is that I have lived with PTSD since I served in Vietnam as a U.S. Marine. I am no stranger to this malady, and I know I am capable of barbaric behavior under the right circumstances. Now, more evidence suggests that this demon becomes more difficult to manage as we age. PTSD Forum had a post about the Dragon Brain – The Dark Side of the Lizard Brain, which along with a study at Stanford forty years ago may offer more insight of how Mao, starting out as a young sensitive poet and activist for the poor, was responsible for decisions later in his life that led to the failed Great Leap Forward then The Cultural Revolution. I suspect there may be a link between PTSD and a piece that I read in the July/August 2011 Stanford magazine — Six Days on the Dark Side -The Menace Within. Forty years ago professor Phil Zimbardo (retired 2007) of Stanford’s psychology department conducted an experiment that was meant to run for twelve days but was stopped after six. What the Stanford Prison Experiment (PSE) revealed was that ordinary college students were capable of doing terrible things under the right/wrong circumstances (like what happened at Abu Ghraib where Iraqi prisoners were abused and tortured by U.S. troops). In fact, in the last decade, after the revelations of abuses committed by U.S. military and intelligence personal at prisons in Iraq and Afghanistan, the SPE provided lessons in how good people placed in adverse conditions can act barbarically. After Mao’s death and during Deng Xiaoping’s Beijing Spring, it was the collective consensus in China that Mao liberated China and was a good ruler 70% of the time. It may be difficult for many in the West to accept that Mao liberated most of the people of China from a worse life, but he did. Now we may look back in hindsight and see that Mao was a product of his environment. He was not only the leader of the People’s Republic of China, but he was also making decisions (mostly during the last decade of his life) influenced not only by CPTSD but also what SPE revealed about how good people placed in adverse conditions can act barbarically. That does not make him a monster. It makes him the victim of an environment he had little control over at a young age, and if you want to discover what that environment was, I suggest reading Mao and Complex Post Traumatic Stress Disorder and the links provided that reveals some of his life. NPR’s Neal Conan said the deaths from the Cultural Revolution were between 20 to 40 million, which demonstrated his ignorance since that many deaths took place earlier during The Great Leap Forward (1958 – 1960). The Great Leap Forward was supposed to be a 5-year plan, but it was called off after just three tragic years. The period between 1958 and 1960 is known in China as the “Three Bitter Years”. The loss of life during The Cultural Revolution (1966 – 1976) was about 2 (or more) million and many were suicides due to the denunciations and persecutions and the fact that society had been turned upside down. The Cultural Revolution deeply damaged the country economically and socially. Sociologist Daniel Chirot claims that around 100 million people suffered and at least one million people, and perhaps as many as 20 million, died in the Cultural Revolution but there is no way to prove this claim. The deaths from the Great Leap Forward were mostly from starvation due to a famine, which may have been caused by a combination of Mao’s failed agricultural and industrialization policies and poor weather leading to crop failures and a famine. Since no one knows the exact number of deaths due to these blunders/weather, some have said 10 million while others have claimed 60 million. Most experts agree that the number was about 20 or 30 million. What one believes about the results of The Great Leap Forward and the Cultural Revolution has to do with prejudices, or personal political opinions. One thing most can agree on is that this period of China’s history was a failure and a tragedy. During the interview, no one asked or mentioned how the Communist Party led by Deng Xiaoping after Mao’s death in 1976, repudiated the Maoist Revolutionary thought that was responsible for the tragedy, and then opened China to world trade, joined the World Trade Organization (WTO) and launched the Chinese Capitalist Revolution leading to the economic miracle China has become today. If you are interested in hearing the entire interview, visit Henry Kissinger appearing on NPR’s Talk of the Nation or read the transcript. The last time I looked, which was a moment ago, the US flag was red, white and blue with 50 stars and 13 stripes; many in the US love football, baseball, basketball, mom and apple pie and eighty percent of its citizens are Christians. The founders were men such as George Washington, Thomas Jefferson, and John Adams. The Declaration of Independence of 1776 and the US Constitution were written for the United States of America. If you are an American, do you have a copy of both the Declaration of Independence and the Constitution? I do. Have you read it and if you have, how much do you remember besides ‘the Pursuit of Happiness’, which many in the US want the US government to pay for these days? China may start with the letter “C” as California does, but it is not part of the US, and its founding fathers were men such as Sun Yat-sen, Mao, and Deng Xiaoping and about 3 to 7% of Chinese are Christians while more than 60% belong to no religion. CNN ran a piece on its CNN Wire service of a Chinese artist and citizen of the People’s Republic of China, (PRC). His name is Ai Weiwei. The title of the piece was, “China says Ai Weiwei is being held for economic crimes“. Ai Weiwei is also one of China’s best-known artists. He helped design the Bird’s Nest stadium for the 2008 Beijing Olympic. Ai Weiwei is more than an artist. He is also a democracy activist and a critic of his government. The US Constitution protects US citizens when they criticize the government. However, the Chinese Constitution does not offer the same protections. In fact, most countries don’t. In Saudi Arabia, woman cannot work or drive and criminals are often executed by beheading—a practice once common in China but no more. In fact, the American CIA has taken advantage of foreign laws such as those in Saudi Arabia and Egypt when terrorists have been sent for torture and questioning without the due process of law as guaranteed in the US (not outside of it). The cover of The Economist’s November 13 issue plays on fear to sell magazines. I haven’t read Buying up the world, The coming wave of Chinese takeovers yet, which is the feature piece. I’ll probably write another post about that once I do. Instead, I’m writing about the magazine’s cover, which is taking advantage of the West’s PTCSD (Post Traumatic Chinese Stress Disorder) that has roots in the “history” of a fear of the word “Communist”, the Korean Conflict and the Cultural Revolution. I’m sure most Sinophobes that see this cover will have flashbacks of the People’s Liberation Army (PLA) and the rest of China dressed in drab Mao jackets marching across the world to take possession of everything China buys. 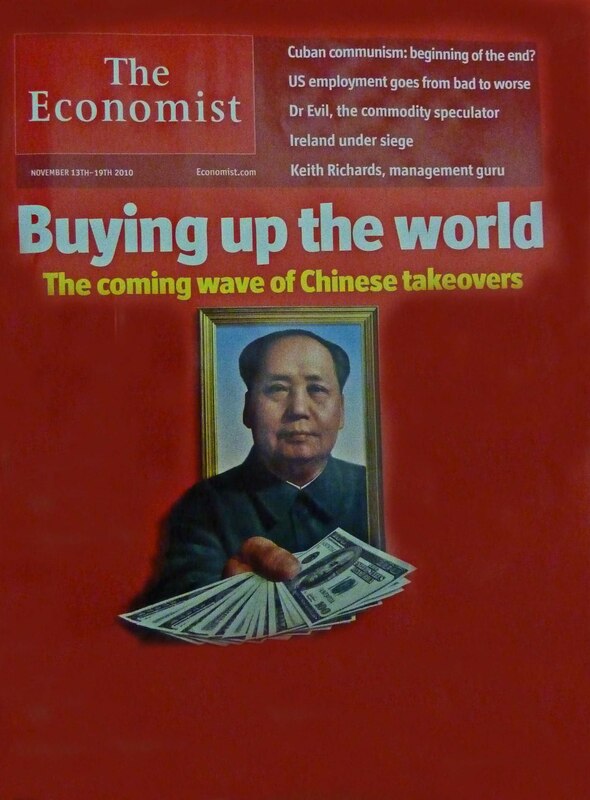 However, Mao isn’t the proper man to adorn The Economist’s cover. Deng Xiaoping or one of China’s recent presidents (there have been four since the 1982 Constitution) would have been more appropriate. Why? Because after Mao died in 1976, Deng Xiaoping and his allies rejected Maoist Revolutionary thought and embraced CAPITALISM in a very big way. In fact, surviving Maoists consider the Party that rules China today to be traitors to Mao and the revolution. Do you remember the 1980s, when wealthy Japanese spent billions buying property in America then a real estate bubble burst, Japan lost a lot of money, and its economy has been limping since? If anyone should be afraid, it should be the Chinese fearing spending habits in the US, Canada and Europe where debt and plastic rule.